The Black Stars have a score to settle with the Bafana Bafana at the Kumasi Sports Stadium on Sunday as the African Zone 2 World Cup qualifiers move into second gear this weekend. But Ghanaian trainer, Mariano Barreto, says it would be foolish to write off the South Africans. The Portuguese coach believes the battle to clinch the only spot in Group 2 could be excruciatingly uncomfortable if any of the sides is taken lightly. That is why he is being extra cautious, and attaching seriousness to the match with the invitation of experienced and well-tested legs to do battle. 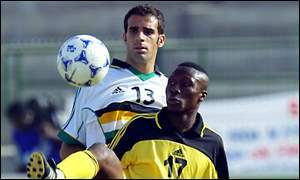 That traumatic 0-1 defeat South Africa inflicted on Ghana courtesy Siyabonga Nomvete in Kumasi four years ago during the 2000 Nations Cup is still fresh on the minds of the Black Stars, a defeat which effectively killed off the hopes of the Black Stars to make it to the 2000 finals. So when the two sides clash in a tricky World Cup qualifier again in Kumasi, the Black Stars would attempt to pay the Bafana Bafana back and stake a strong claim to the ultimate for the first time. The bookmakers have tipped the two sides as favourites in Group 2, but a big question mark was quickly in relation to the Stars when they faltered against the Stallions of Burkina Faso in their opening group match in Ouagadougou. That defeat brought to the fore the fact that the road to Germany 2006 would not be rosy for Ghana. Missing the services of some key players in their opening group matches, coaches Barreto of Ghana and Baxter of South Africa are not taking chances as Sunday's match holds a lot for their ambitions. Barreto has recalled Ibrahim Tanko and Augustine Arhinful to give the attack some bite,while Baxter had also recalled the experienced Mark Fish of Charlton Athletic, Siyabonga Nomvete who plies his career in Salernitana in Italy, F.C. Copenhagen's Sibusiso Zuma and Russian-based Jacob Lekgetho and MacBeth Sibaya. The menacing Nomvete is remembered for that stunning strike against the Black Stars in Kumasi in 2000, and he could form a deadly partnership with Charlton Athletics' Shaun Bartlett.But the absence of F.C. Porto's Champions League winning team star, Benni McCarthy, could have a telling effect on the Bafana Bafana. The player who recently got married has decided to enjoy his honeymoon rather than feature for his native country. South Africa emerged from apartheid a decade ago, a surprising powerhouse in Africa football and were able to make it to the World Cup in their very first attempt. Today, they have won the bid to host the 2010 edition of the greatest sporting event in the world.This is a great achievement for a nation that was previously cut off from all sporting event, as a result of apartheid. The Bafana Bafana would want to qualify for Germany 2006 to remind the world that the fierce battle they waged to wrestle the hosting of the 2010 event was not just for reasons of infrastructure and security, but also for the development of the game proper. They currently occupy the top spot in the Zone with three points, having beaten the relatively unknown Cape Verde 2-1 in Bloemfontein in the opening match with goals coming from skipper Mbulelo Mabizela. This is a position they would strive to guard, and the Black Stars could be in for a stiff opposition. A defeat, or even a draw for Ghana, would be catastrophic. That would sound the death knell of the Black Stars, and the fans would not take anything other than a win. It is still surprising why Ghana, always benefiting from a depth in talent, has never made it to the World Cup. Many have put the blame on poor planning and lack of support from officialdom. The current team is a conglomeration of budding new talents and experienced players who have the capacity to join the big ones on stage in Germany 2006. The Black Stars need to focus on teamwork, conditioning and mentality to overpower the well drilled South Africans. Motivation has gone up to some extent in the Stars' camp inspite of the reported late payment of per diem for the opening group match.The return of Bayern Munich's Samuel Osei Kuffour after pulling an injury in the match against Burkina Faso is good news, and he would be expected to form a strong back line with Mireku, John Mensah and Dan Quaye to cut out the South African attack. South Africa could even be more physically imposing in defence with the return of Mark Fish, and Ghana would have to apply a lot of energy attacking them. Stephen Appiah still remains an influential captain and a great ball player in midfield, and it would be interesting to see how he and his forces battle Sibusiso Zuma and Tottenham Hotspurs' Mbulelo Mabisela in the middle. Kumasi fans have already promised a massive turnout at the stadium on Sunday to give the Black Stars the support to victory.